You know I love coupons. A year ago, however, I had yet to see the coupon light. I didn’t know it was possible to get items from grocery and drugstores for free. Now I know it’s not only possible to get things for free, sometimes you can even profit from buying certain items. I went grocery shopping at Harris Teeter this past weekend for a bunch of items. I’m a member of their VIC program — their equivalent of a frequent shopper’s program. They also have a program called e-VIC which is basically an amped-up version of the VIC program. As an e-VIC member, I get additional savings on certain items and access to electronic coupons that can be downloaded directly to my VIC card. The coupons get deducted automatically at the register when I buy the corresponding items. The fun thing (yes, I think coupons are fun — don’t you?) about the e-coupons at Harris Teeter is that you can use them in conjunction with paper manufacturers’ coupons for extra savings. When you combine an e-coupon with a manufacturer’s coupon with a store sale, well it’s like winning the lottery. So this past weekend I bought this salt. I would have taken a photo of the actual container of salt I bought, but Charlie recently broke our digital camera. That's a whole other yikes money story though. The salt retails for $1.99, but Harris Teeter had it on sale as a buy-one-get-one free (which, by the way, means that it’s half off; you don’t actually have to buy two to get one of them free). I had a paper manufacturer’s coupon for $.50 off which I knew Harris Teeter would double to $1.00 off (their coupon policy is to double paper coupons with a face value up to $.99). I also had an e-coupon for $1.00 off Diamond Crystal sea salt. Now, if you’re using a manufacturer’s coupon, Harris Teeter won’t let you profit off an item; that is, if the item is $.75 and your coupon is for $1.00, they’ll only deduct $.75 from your total. So I was curious what would happen if I used a manufacturer’s coupon with an e-coupon — using either of these would make the salt free, but combined, I stood to profit by $1.00. Well, the e-coupon system and the manufacturer’s coupon systems clearly don’t talk to each other at the register because both happily deducted from my total. Thus, it was like Harris Teeter paid me $1.00 to buy the salt. I came home so, so proud of my profit. I told Mark about it and, while impressed, he said that next time I stand to make money off an item, I need to buy only that item to see what would happen. Mark reasons that the real excitement would be to walk out of a grocery store with more money in my pocket than when I went in. Oh yes, indeed, that is a titillating prospect. Ah, how life changes. The last time our local grocery store, Harris Teeter, offered a week in which they tripled the value of manufacturers’ coupons up to $.99, I wasn’t even using coupons. Now, 14 months later, I can’t imagine shopping for groceries without coupons. In fact, I keep my coupons in my purse at all times just in case I need to make an impromptu run to the store. If you’re a Harris Teeter customer and have not yet been convinced of the incredible savings to be had with coupons, this is the week to start flexing some money-saving muscles at the grocery store. The triple coupon offer is good now through next Tuesday, May 24. In effect, the triple coupon offer means that $.50 and $.75 coupons triple in value to $1.50 and $2.25, respectively. It doesn’t take sophisticated math skills to realize that using coupons this week could translate into a lot of free or deeply discounted items. This example above is pretty self-explanatory, but Newman’s Own salsa is on sale for $2 this week (it’s usually about $3, I think). Currently, there’s a printable manufacturer’s coupon available for $.50 off one Newman’s Own item and if you click on “printable” from Southern Savers, you’ll be taken directly to a website where you can print the coupon (if you’ve never printed coupons before, you’ll need to install a driver. It’s quick and easy). When you purchase the salsa, give the cashier your coupon and the computer system will automatically triple the coupon and deduct $1.50 from your bill, thus making the salsa $.50. Since Newman’s Own is Mark’s favorite salsa and we routinely buy it, it’s in our best interests to buy it now for $.50 rather than later when it will be $3.00. The printable Newman’s Own coupon should print two or three times, so when I go to the store this weekend, I’ll buy however many jars of this salsa I have coupons for since I know it will keep and we’ll definitely eat it. If you don’t want to use the Southern Savers lists, you can also just go looking for printable coupons on your own. I like coupons.com, allyou.com, redplum.com, smartsource.com and, for organic deals, mambosprouts.com. And, of course, if you happen to have coupons from your newspaper inserts, start clipping those too. So Harris Teeter customers, go forth and conquer coupons this week! You won’t regret it. I am not a night owl. I have always had a hard time staying awake at night even when I’m doing things I enjoy. It’s no wonder then that I’m a real mess when I have to work in the evenings, which I’ve done a lot lately. My day job has been crazy busy so more often than not I bring work home and do it after I put Charlie to bed. Recently, I fell asleep in the middle of editing a paper on my lap. 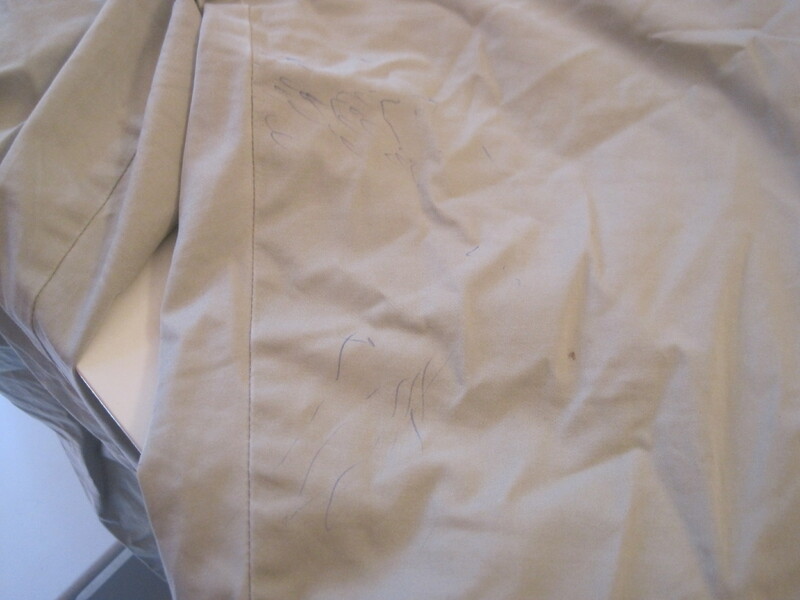 When I woke, I had pen marks all over the crotch area of my khaki pants. Doh! I was particularly distraught because these khakis happen to be one of the few pairs of pants that currently fit comfortably. I felt so overwhelmed looking at these marked up pants that I threw them in the bottom of the clothes hamper and avoided them for a few weeks. I was pretty sure that I couldn’t just toss the pants in the washing machine, cross my fingers, and hope for the best. This weekend I gathered enough energy to try to figure out how to fix them. I consulted this handy little book I got free one year for subscribing to Consumer Reports. 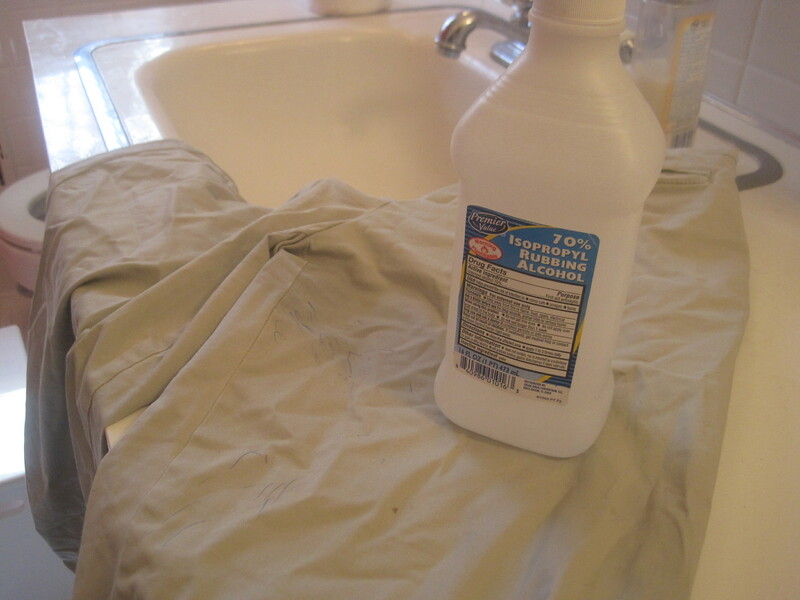 It’s called How to Clean Practically Everything and, sure enough, it offered a simple solution to remove ink from clothing: dab some rubbing alcohol on a neutral colored cloth (you don’t want to run the risk of the cloth bleeding into the clothing), rub the clothing gently and watch the ink disappear. It worked like a charm, although I had to use quite a bit of rubbing alcohol because, though I began with “dabbing,” “pouring” seemed a heck of a lot easier. 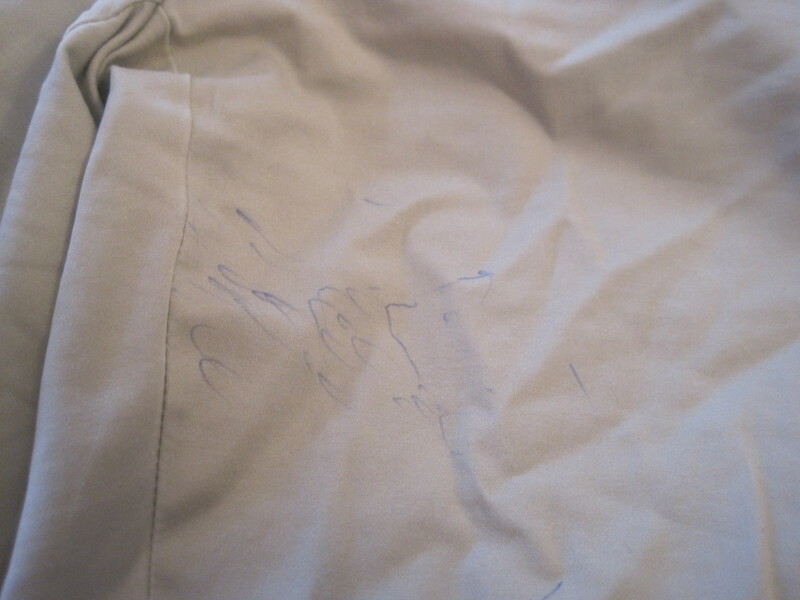 I just poured a small amount on the pants and rubbed away at the ink. (Be warned though: the book advises not to use rubbing alcohol on ink from fountain pens; my ink of choice was ballpoint pen). Then I rinsed the pants and the cloth briefly in some water and threw both of them in the washing machine. 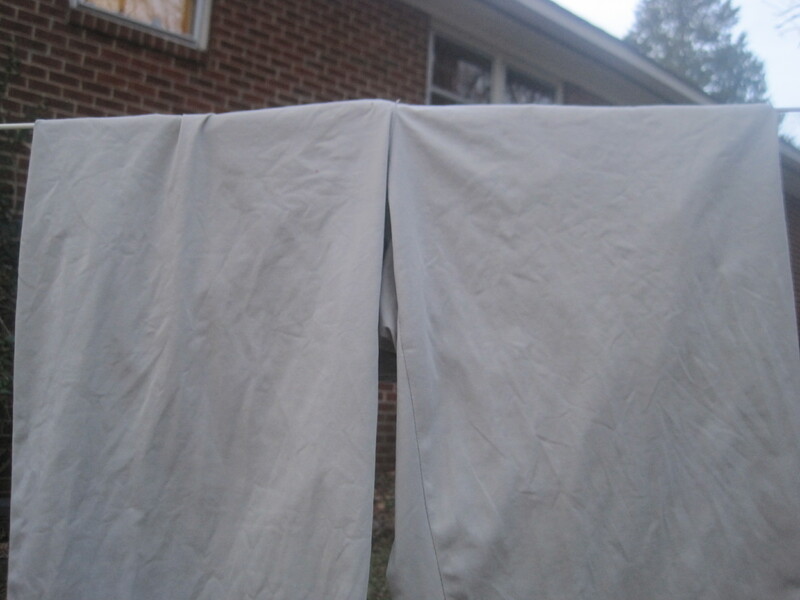 Here are the pants all clean and dry on the laundry line in the backyard. Good as new. I can’t believe I let a comfortable pair of pants sit in the hamper for weeks when they were so easy to clean. What a relief they are for my tumbling waistline. Over the past year since starting this blog, I’ve done a lot of things to try to save some money. Few, however, are as satisfying to me as using coupons. I now use coupons for so many things I buy that I absolutely loathe paying retail for anything. If you’re thinking about ways to save money but don’t know where to begin, start with coupons. Chances are you’ll get hooked when you see how much money you can save on items you normally buy. No buying items I wouldn’t use simply because I had a coupon. All told, I bought 14 items using coupons and paid $12.25 (which averages to $.88 an item). Had I paid full retail for these items, they would have cost $46.75 (my savings using my Harris Teeter frequent shopper card was $10.91 and my coupon savings were $23.59), so I saved 74% overall. 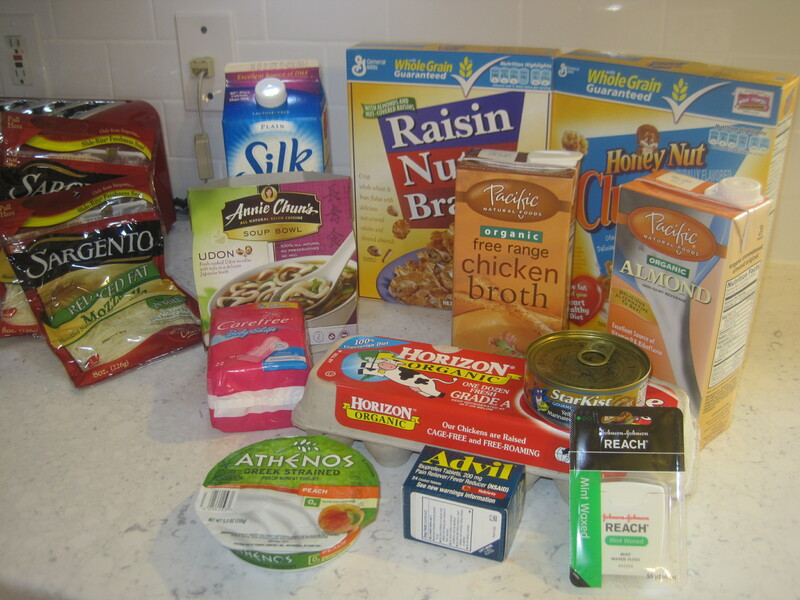 While the average cost of my items was $.88, I got a few items absolutely free using my coupons: Advil (22 count), Reach dental floss, and Athenos Greek yogurt. I bought organic almond milk for $.25, tuna for $.22, soup for $.34, and pantiliners for $.49. I bought soy milk for $.99 and two boxes of cereal for $1.50 each. The most expensive thing I bought (by far, in fact) was organic eggs for $2.69. While these savings are fantastic, I must confess that they are not typical for me, so don’t get discouraged if you try using coupons and you can’t immediately replicate 74% in savings. I normally save between 25% and 50% when I use coupons, savings that add up quickly. If you’re new to using coupons, check out some of my coupon tutorials (which you can read here, here, here, or here). If you want to start quickly printing coupons, try to coupons.com, smartsource.com, or redplum.com. You’ll likely need to download a coupon driver to print coupons, but it’s quick and easy. If you’re interested in organic food, I often check out organicdeals.com for links to coupons for organic items. Finally, many grocery stores allow you to load electronic coupons directly onto your frequent shopper card. I do this for Harris Teeter as well as Kroger (you can also add e-coupons to your Kroger card through cellfire.com). Just be aware that e-coupons do not double (although you can use them in conjunction with a paper manufacturer’s coupon for some big savings) and I’ve had problems with the scanner not automatically deducting the e-coupon when I check out, so now I always print at home the list of coupons on my frequent shopper card and bring it with me to the grocery store. If a coupon fails to deduct, I just show my print out and the teller manually deducts it). Now grab some coupons and go shopping! Recently I read (or maybe I was told, or maybe I just imagined it), that you should shop around for auto and home insurance every six months to make sure you’re getting the best deal. We’ve had the same insurance coverage for over six years, not due to my fondness for the company, the coverage, or the price, but rather due to inertia (as well as a hearty dose of laziness and procrastination on my part). I just somehow can’t be bothered to shop around for insurance. But about six weeks ago I neglected to pay our insurance bill, realized it was a few days late, and just called our insurance agency in order to pay it over the phone. At that time, I asked the agent whether there was any way to save money on our policy. She said she’d check into it and call me back. I didn’t hear back from her. This sort of annoyed me whenever it would cross my mind (which truthfully was not very often), and I even dreamed about just finding a new company. But that old problem of laziness and procrastination overtook me so I did nothing. Today, out of the blue, I got a call from the insurance agent who apologized for not getting back to me sooner, but she said she knew that the insurance company we work with was going to be redoing its rates soon so she’d deliberately delayed re-calculating our policy until the new rates were published. Bottom line: she’s sending us a new policy which will offer us the exact same coverage we had before but for over $300 less a year. And who said procrastination never pays? Though I haven’t been using coupons for very long, I am now a faithful user and regularly reap the benefits. If you’re a Harris Teeter grocery store customer and have been thinking about beginning to use coupons, this week is a great time to start. Harris Teeter’s normal coupon policy is to double coupons up to $.99, so if you have a coupon for $.75 off, Harris Teeter will double it to give you $1.50 off. But, if you have a coupon for $1.00 off an item, Harris Teeter won’t double it. This week from 1/5 through 1/11, however, Harris Teeter will double coupons up to $1.99 which means all those $1.00 off coupons will double to $2.00 off and $1.50 coupons will double to a whopping $3.00 off. If you do try out the Harris Teeter super double coupons, there are a few rules you’ll need to be aware of (you can see the complete Harris Teeter coupon policy here). Harris Teeter will only double 20 coupons a day. If you’ve amassed more than 20 coupons, only the first 20 will be doubled (but you could save them and shop on another day this week and they’ll be doubled). There are no “money makers” so if you have a coupon for $1.00 off an item and the item is $1.55, Harris Teeter will only double the coupon to $1.55. You can only redeem two internet coupons for a like item per day (that is, if you have printed three coupons for $1.00 off Philadelphia brand cream cheese, you can only use two of them per day). Please note, however, that some manufacturers’ coupons specifically say “do not double,” so you’ll need to be aware of those coupons (just to complicate matters further, some of these coupons actually do double; if you want to know how to tell which ones will double, leave a comment and I’ll explain further). No need to fret if you haven’t been collecting coupons from newspaper inserts. There are lots of websites that offer printable coupons. I like coupons.com the best, but I also use redplum.com and smartsource.com (you’ll need to download a coupon driver in order to print them from any of these sites, but it’s quick and easy to do). If you have a favorite brand, it’s easy to do a quick Internet search to see if that brand currently offers coupons from their website. I just did a search for “Pacific foods” on Google because I know they often have coupons for some of their organic products. Sure enough, their website offers printable coupons, although you do have to enter your name and email address. Stonyfield and Organic Valley also regularly offer coupons on their organic dairy products, but you have to register to be able to access the coupons. If you really get excited about printing coupons from the Internet, many people recommend creating a new email account just for coupon use in order to avoid getting spam in your regular email account. Personally, I’ve never had a problem with spam from the coupon sites where I’ve signed up. I’ve written about strategies to maximize coupon use here and here, which you can review to get some good tips. Here’s a quick nuts and bolts guide to score some great deals this week at Harris Teeter. First, go to one of the many blogs that detail all the current coupon deals. For my area, I like Southern Savers and Madame Deals; both of these sites cover sales for two of the grocery stores I visit the most (Harris Teeter and Kroger). A great way to save money with coupons is to use them in conjunction with a store sale, which is where Southern Savers and Madame Deals really come in handy. Sites like these take the weekly sale items from Harris Teeter (which you need to be a VIC member to take advantage of) and match them with currently available manufacturers’ coupons; they even offer links to printable coupons where applicable. So for example, this week Southern Savers not only details all the Harris Teeter advertised sale items and matches them with available coupons which you can check out here, but you can also see a list of unadvertised deals here, and here you can see regular priced items that, with available coupons, you can get for a great deal. There are quite a lot of items that you can get for free or under $1 if you have a coupon. You can even generate your shopping list and print it out directly from the site. Finally, you can check out a list of available $1.50 off coupons here to see if any are for products you’re interested in. If you’re at all interested in trying to use coupons, I really encourage you to just go ahead and start. I know that some of these coupon tricks can be confusing at first. Maximizing deals takes some practice, but it’s definitely worth going through the learning curve. Please feel free to leave a comment with any questions you have and I’ll be happy to answer them as best I can. Good luck and have fun! Color me impressed. Eight days ago I signed up for free compact fluorescent light bulbs (CFLs) from Duke Energy. It was quick and easy to sign up, and I qualified for an impressive 15 CFLs. The only downside was that Duke Energy said it would take 4-6 weeks for the light bulbs to arrive. Instead, they arrived in Saturday’s mail. Yup, that’s right, they arrived in less than a week. Right here is where I intended to insert a nice little photo showing all my new light bulbs lined up. But, once again, I’ve misplaced the cord which connects my digital camera to the computer, so no photos on blog posts until I find it. (I also wanted to post what I hope are great Halloween photos, but that also won’t be happening until the cord shows up. You’ll just have to trust me that Charlie was the cutest little pumpkin around). Anyhow, if you’re a Duke Energy customer, don’t forget to sign up for your free CFLs here.